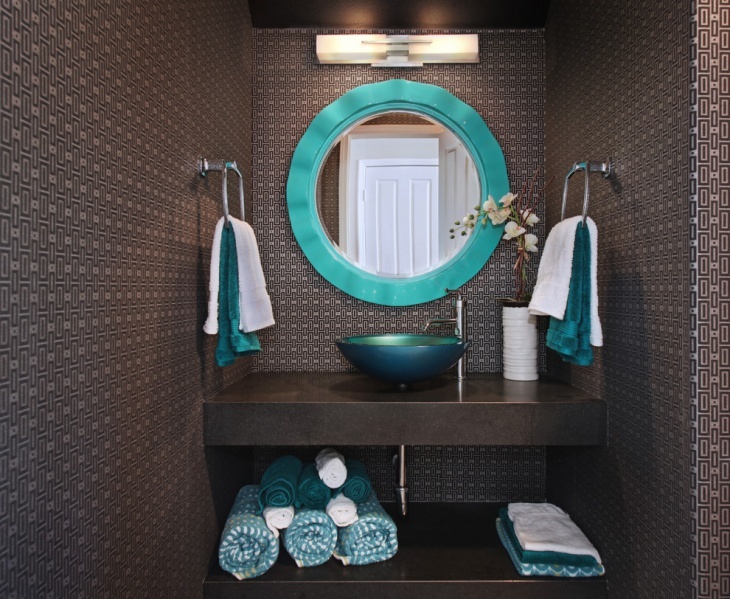 A powder room can be a space separted from the bathroom. 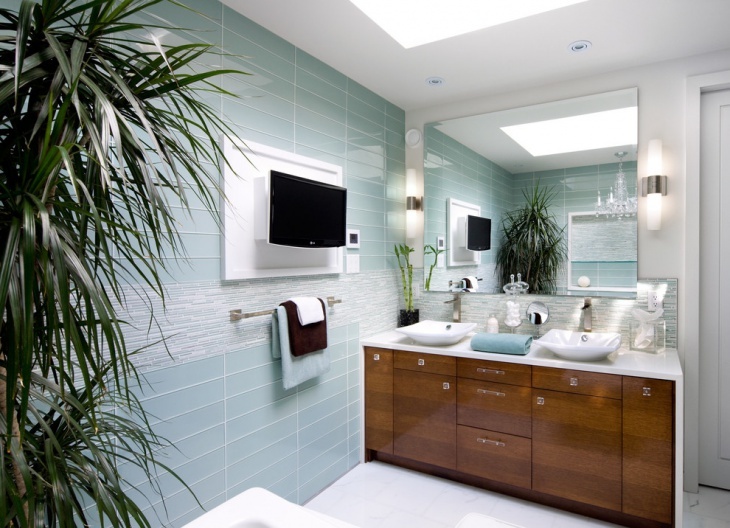 Otherwise, it can be a simple vanity installed inside the bathroom. 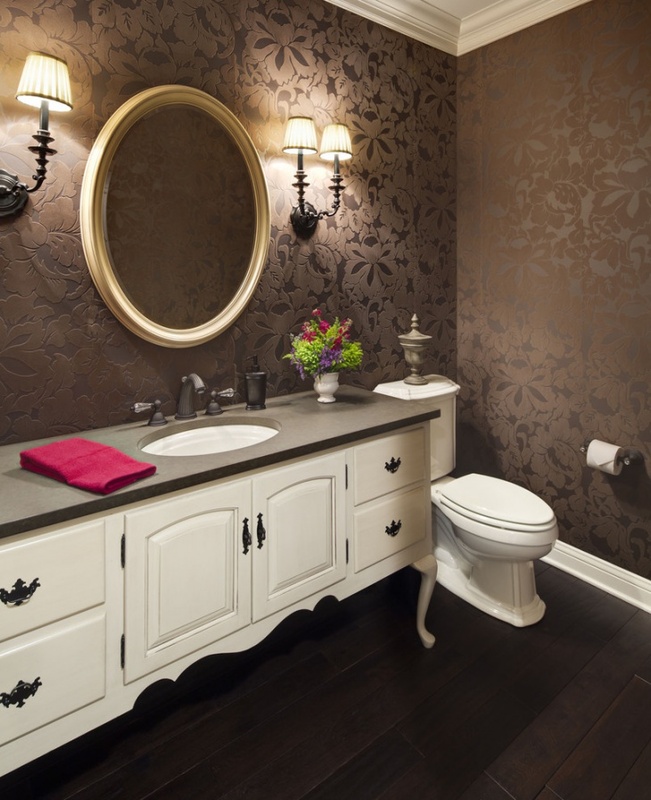 If you have a big house, then it would be nice to have a powder room and a bathroom. If the space you have is just enough, do not despair. 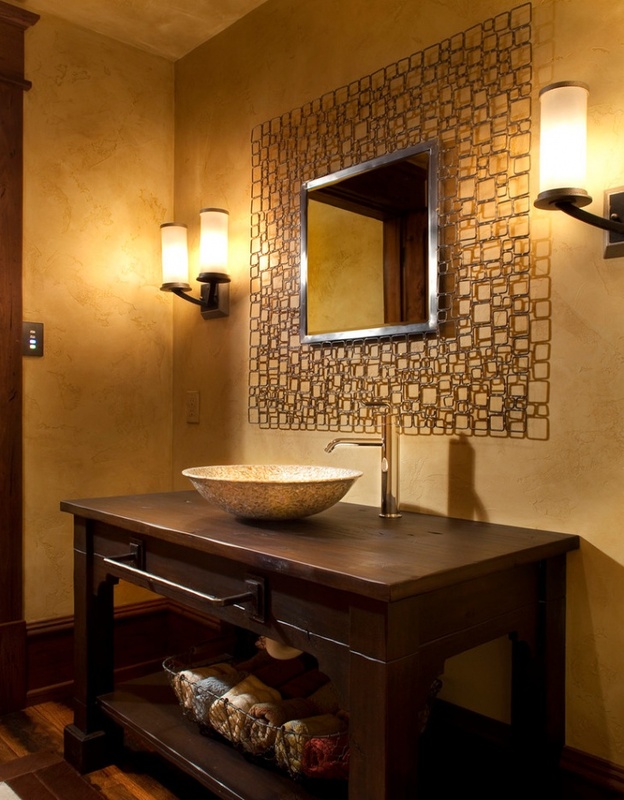 There are several powder room vanity designs that can be used for small spaced bathrooms. 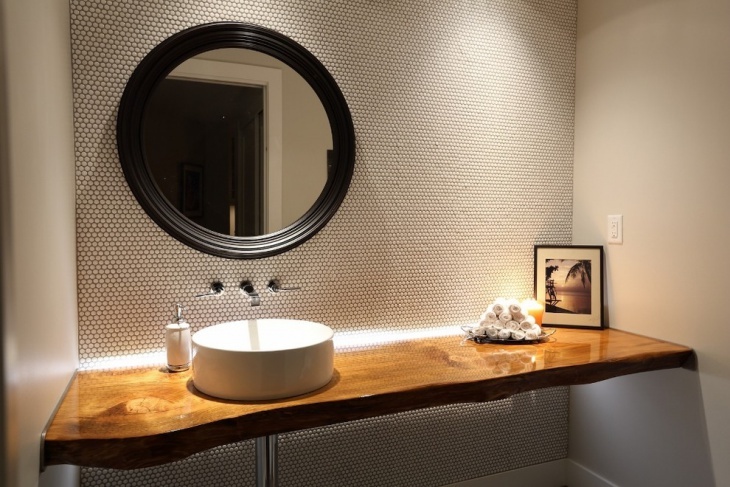 There are several factors to consider in creating a bathroom vanity, which include the vanity mirror, the lighting, sink, and cabinetry. This small powder room vanity is set in one corner and it has a simple and rustic marble topped counter with wooden bathroom storage. The glass sink bowl matches the glass vases on display. The beveled mirror provides an enchanting focal point and its beauty is enhanced by the lights shining from the two sconces. 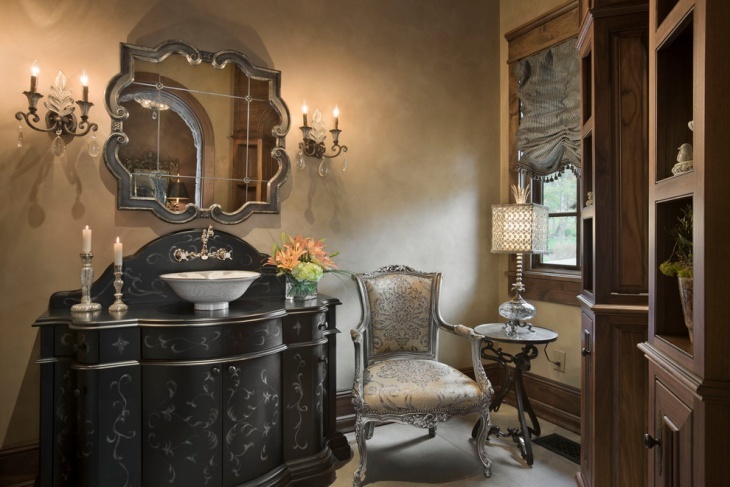 This powder room has a rustic wood base bathroom cabinet with marble top and attached mirror. 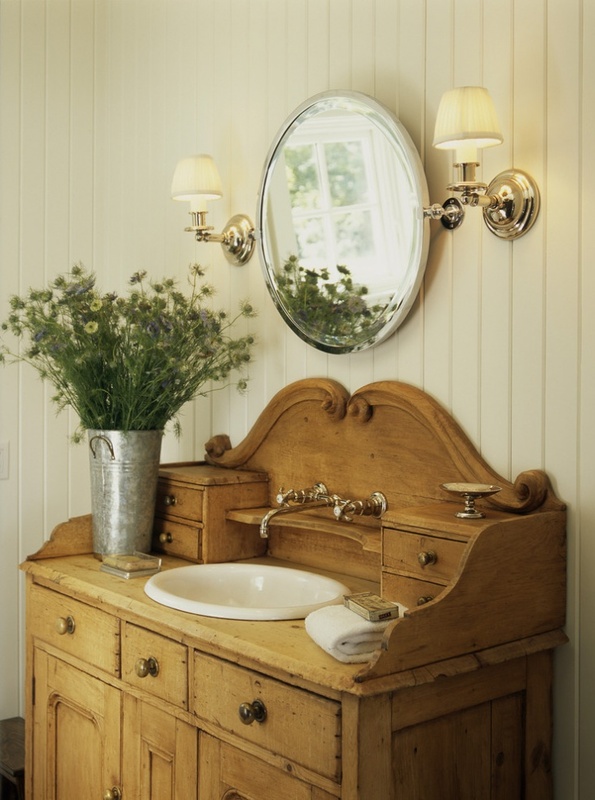 Below the mirror are lever handles that are as rustic in appeal as the rest of the room. 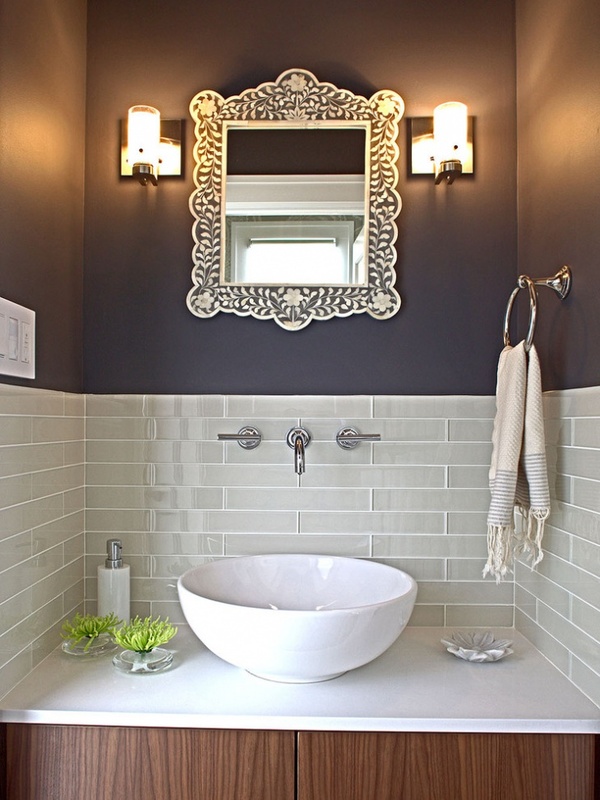 The small copper vessel sink adds some elegance while the metal grab bars add functionality as towel holders. 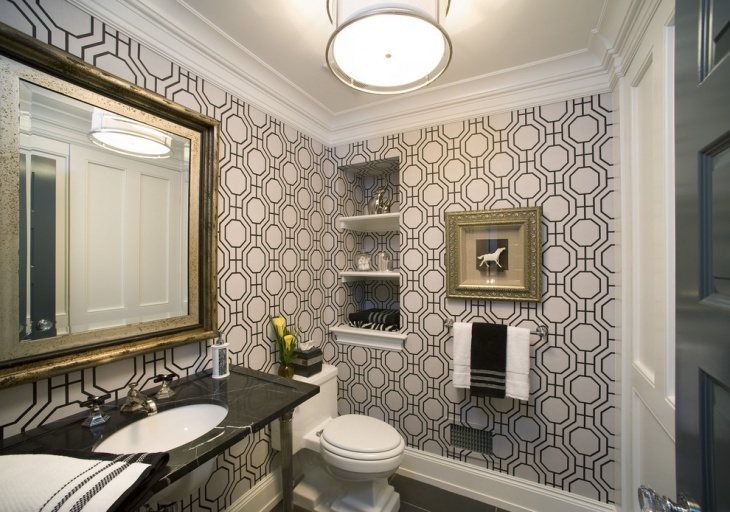 This powder room is definitely modern and elegant. It has the elements of artistry, chic and class. The huge wall art painting should look out of place in a vanity room, but since the overall appeal of the room is classy it’s just perfect. The marble topped cabinet has stainless steel sink, and the wide mirror is the ideal option. 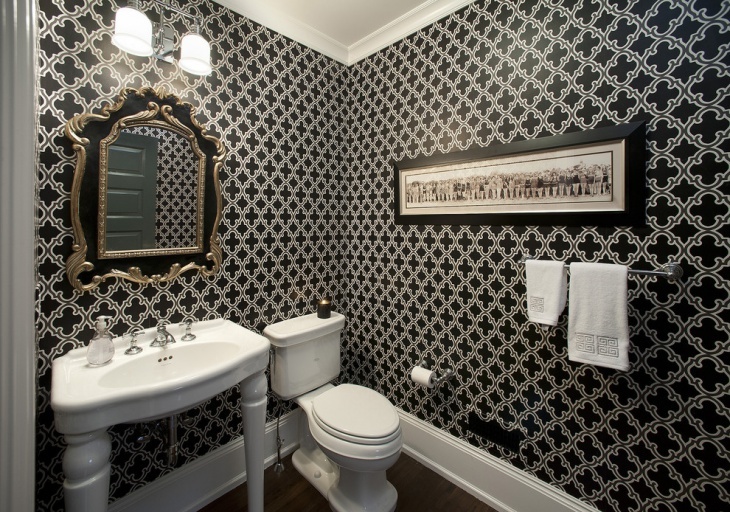 The antique look of this powder room is definitely unique in this day and age. It looks like something out of a scene of an old movie, and yet it is really fascinating and would probably be appropriate if you like such designs. 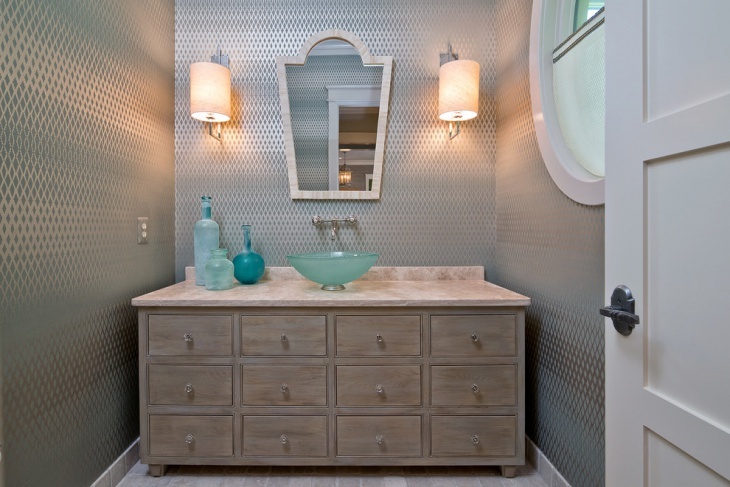 First off, the mirror and the vanity cabinet is the perfect match. The lights from the fake candle sconces are warm and soothing. The chair is a good addition, as well as the small table with the lamp. The floating wooden vanity cabinet is something already out of the ordinary. The sink installed in the middle adds more uniqueness and it provides the room with a nice appeal. The mirror in metal frame adds some industrial feel. 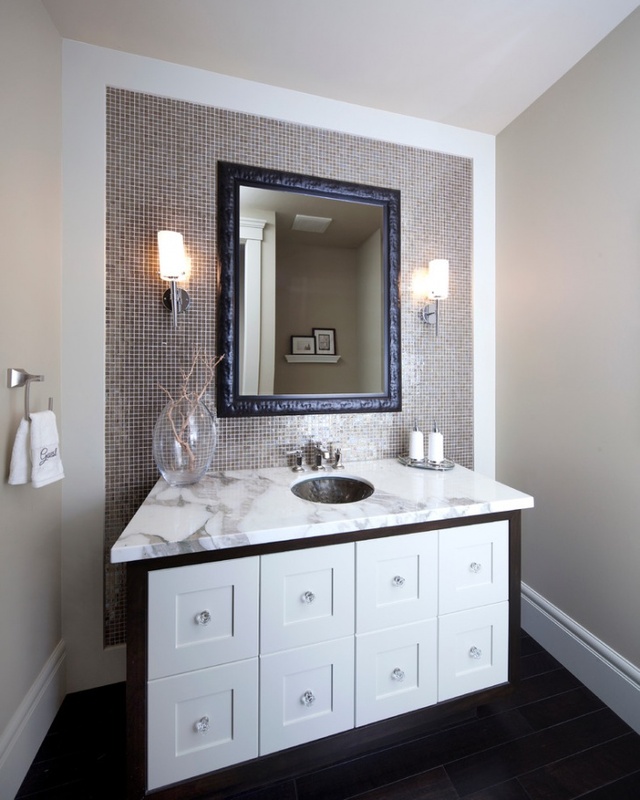 The marble topped vanity cabinet used for this room has built in sink and installed faucets. 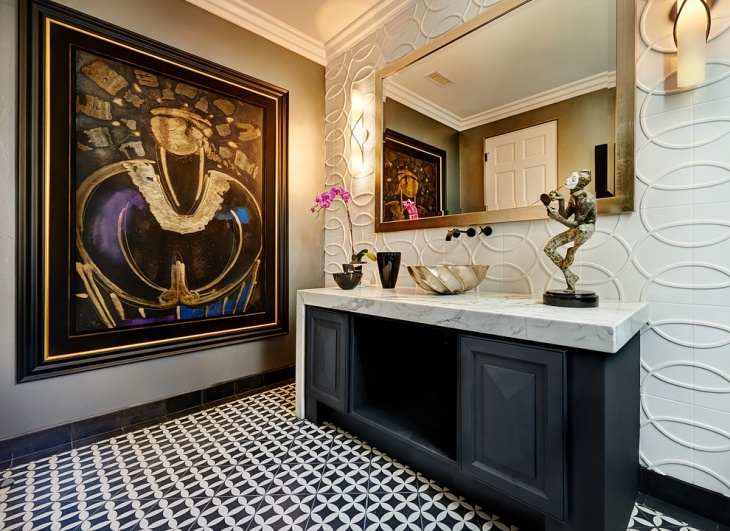 The mirror is very classic and unique, and it adds class into the interior design. 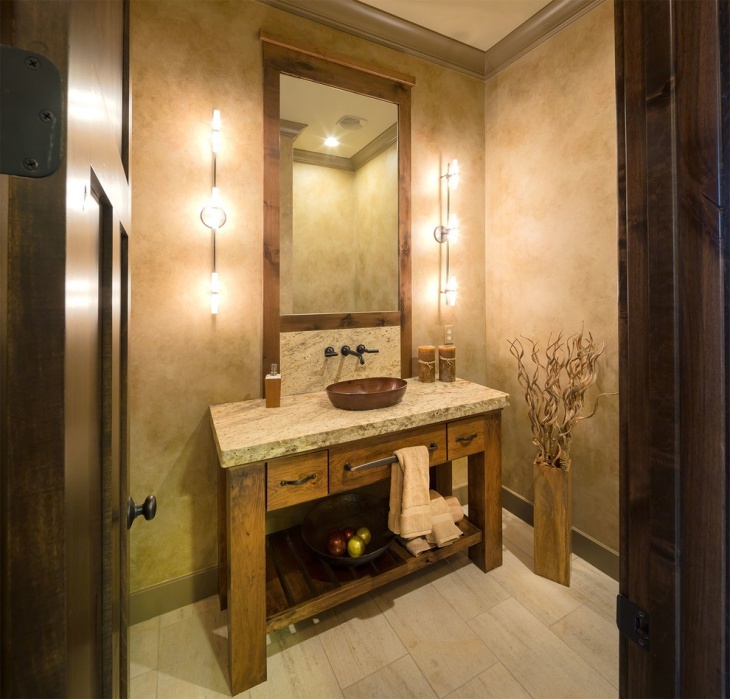 This Mediterranean powder room has a wooden wash stand that looks really rustic yet appealing. 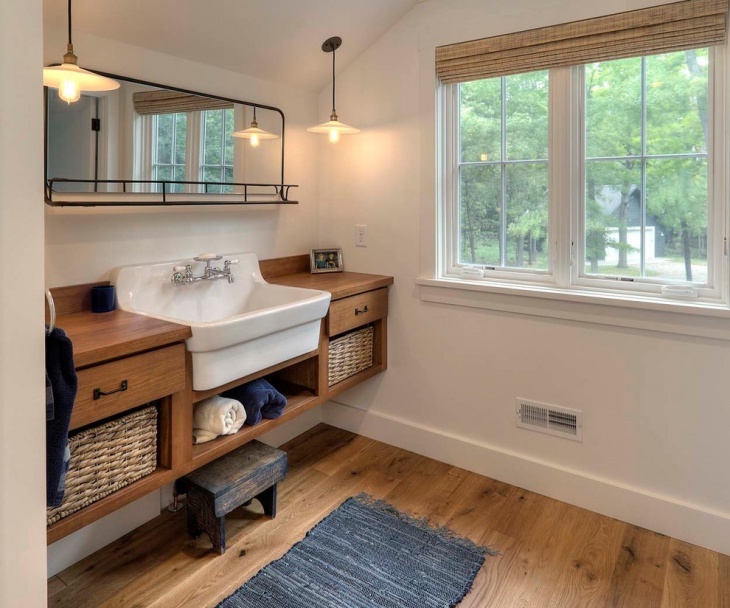 The plumbing makes it less antique and more modern, but the scrubbed look keeps the classic look. The oval mirror is also traditional. The floral printed wallpaper used for this toilet and vanity room is done in neutral brown and it matches the golden frame of the mirror and the brown marble top of the cabinet. 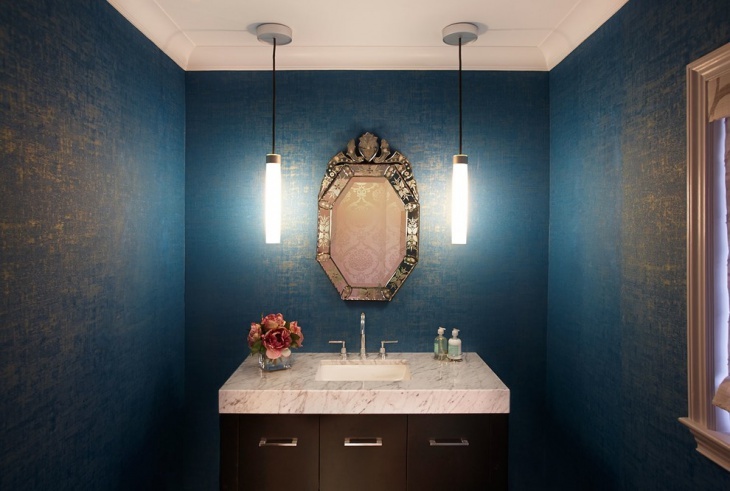 A powder room is that space in your house where you can relax and enjoy a few minutes on your own, while you try to clean your face, apply makeup or just enjoy the time quiet. There are different designs for vanity rooms. The options include traditional vanity with toilet, separate vanity of a double bathroom vanity.